Armor Wrapped Cable - Loos & Co., Inc.
Loos and Company armor wrapped cable is up for any challenge that comes its way. 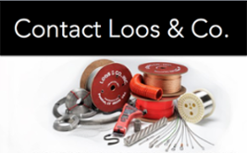 When you need the toughest cable for use in the most abrasive and abusive environments, trust only Loos and Company armor wrapped cable. Often known as tow target cable, our armor wrapped cable begins its life much like any other cable that you would purchase from Loos. 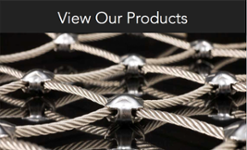 What makes our armor wrapped cable different is that our final process is wrapping and swaging a flat strip of metal shielding around the outside of the cable. A normal cable without shielding will wear down under abrasion. 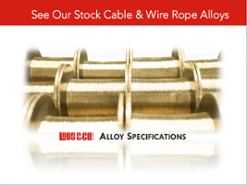 With Loos and Company armor wrapped cable, our metal shielding will take the brunt of the abuse, greatly extending the usage life of your cable. The concept is simple - the flat wrap takes the abuse so that the tensile strength wires don't. Our armor wrapped cable can be manufactured in just about any construction and configuration in sizes ranging from 1/16" to 5/16". It can be manufactured using various galvanized, bright, and stainless steel alloys (302/304, 305, 316, Inconel®, and Monel® to name a few). For added protection and weatherproofing, armor wrapped cable can also be jacketed in a variety of materials from vinyl to nylon. Smooth, rugged, and dependable, Loos and Company armor wrapped cable is the cable for those who can only settle for the toughest product available. Being a manufacturer, we have the ability to manufacture nearly any construction and material of armor wrapped cable. For additional information or to request a quote, please contact us.